Under the Family Medical Leave Act (FMLA), enacted in 1993, most expecting parents, including adoptive ones, are entitled to 12 weeks of unpaid leave within a calendar work year. If a company has more than 50 employees, the Act requires an employer to retain the employee's position during her leave and to provide the same medical benefits as if she were working. However, this leave is unpaid. When anticipating going on maternity leave, you may want to provide your employer with written notice of your intention. If you deliver to your employer a letter explaining when you expect to take leave and that you understand the process, you'll be able to avoid any misunderstandings. The letter you write should be direct, but happy and pleasant. Address it to your boss to ensure that she reads the letter and is put on notice. You may address it to more than one recipient, such as your human resource representative and your boss. If you need help downloading the letters, check out these helpful tips. The letter at right applies when you are only entitled to take the 12 weeks of leave given to you under the FMLA, and will not be taking any additional personal or employer-provided leave. It addresses your right to FMLA leave and thereby reminds the employer that he has federally-mandated obligations to you during this time. The letter also provides information about your intentions and states that you may need your employer to be flexible should an unexpected event occur requiring you to take leave early. In doing so, it reiterates the fact that the event is not necessarily under your control but that you will strive to be as informative as possible and considerate of the employer's need to maintain smooth business operations. Some employers provide their employees with additional leave when the employees are expecting or adopting a new child. The length and terms of this leave vary and could differ from the laws related to FMLA. Note that your employer cannot avoid providing you leave under FMLA if there are more than 50 people working at your company; therefore, any employer-provide leave must be in addition to your leave under the Act. If there are fewer than 50 people at your company, you employer may still provide leave as an added benefit to you. If this is the case, be sure to remove any reference to the FMLA requirements from your maternity leave letter. 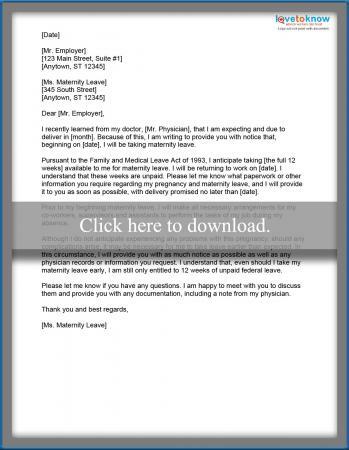 If you are taking FMLA and employer-provided leave, you should identify both types in your letter of intent to take leave. This prevents confusion about what types of leave you will be taking and when you plan to return to your duties. Consult your human resources department for information about employee leave from your company. You can make a few changes to either of these free printable letters to suit your needs. First, provide specific names of all persons mentioned. You may also provide their contact information by listing it at the end of the letter, but this is not required. Second, change the mentioned due date to accord with the one your doctor has provided you. Third, if you are adopting a child, you may want to mention that fact in your letter to avoid confusion. Doing so, however, is not required because it is private information. Although you are entitled to leave if you work at a company with more than 50 employees and your employer faces potential legal action should she try to deny it to you, you should still keep the tone of your letter upbeat and kind. After all, this is a happy occasion! Try to deliver your letter as soon as possible in your second trimester. You may do so earlier, if you wish. You can schedule a meeting with your employer, if necessary, or merely stop by with your letter when you believe he or she has a few minutes to talk. In this circumstance, discuss the contents of the letter with your boss. This will keep the situation upbeat and lighthearted. If your boss is difficult to catch, you may deliver it to her without having a meeting. In this circumstance, however, you should check back in later to ensure that she received and read the letter you sent. This will clear up any confusion that might result from lost letters or other misunderstandings. Good communication is an important part of requesting your maternity leave.